Known primarily for her banjo-centered progressive-jazz albums, Brown brings her instrument back to its bluegrass roots on this, her fifth release. 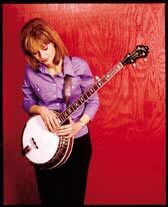 Shes joined by a formidable group of bluegrass heavyweights, including Stuart Duncan and Vince Gill (two old pals from her early days playing in San Diego, CA), Sam Bush, Jerry Douglas and Tony Rice. The aptly-titled opening track, "Late On Arrival", reminds me of so many bluegrass bands wholl trade a round of lighting-fast solos on a tune, then joke "okay, were gonna speed it up a little on this next one." "Fair Weather" is fast, but its also a fine mix of great picking along with melodic, slightly jazz-influenced instrumentals. Along with instrumentals, the album includes some great guest vocals: Bush sings lead on a cover of Elvis Costellos "Everyday I Write the Book," Tim OBrien re-does "Everybodys Talking" from the film "Midnight Cowboy" and Claire Lynch brings her bluegrass twang to "Hummingbird." Fair Weather also plays with your stereo on three tracks. Sit between your speakers and turn them up for "Poes Pickin Party" with Sam Bush playing mandolin in the right channel, and Mike Marshall in the left. "Leaving Cottondale" has not one, but TWO banjo greatsBrown herself in the right channel, along with Bela Fleck in the left channel. And in a rare appearance on acoustic guitar, "Deep Gap" features Brown flatpicking in the right channel, and David Grier in the left. Its a great gimmick, and it works.